Taking care of a tree requires patience, dedication, and the ability to make well-researched decisions. Too many property or landowners make mistakes when it comes to their trees. It is essential to pay attention to your tree without making rash decisions. 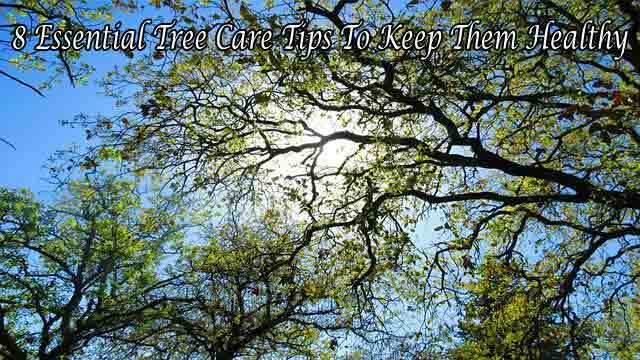 Let’s take a look at the most important tips to consider according to trusted arborists. Mulching is vital, and you want to make it an annual event. The premise behind mulching is to keep the weeds away. Also, mulching helps keep the soil fresh and moist throughout the year. If you avoid mulching, it can start to hamper the tree’s development, and that’s a real cause for concern. To do this the right way, it’s highly recommended to use leaf compost or shredded bark. These offer the best results and are going to ensure things work out as you desire. As for how much you should be using, the “thirds” rule can apply meaning 3 inches of mulch with 3 inches of space (around trunk) inside a 3-foot ring. If you follow this rule, the mulching process will go ahead as smoothly as you want. How much water are you giving to the tree? In some regions, the rainfall is going to do an excellent job of watering the tree. However, you want to keep an eye out and set a watering target. This target should be set at “25 gallons” or 1.5 inches of rainfall per week. You don’t want to ignore this target as that can start to cut into the tree’s growth. If a tree is not getting the amount of water it requires, it’s going to start to break down, and that’s when real damage is caused. One of the common mistake that tree owner make is using their lawnmower near the tree. This is a mistake because the tree is not designed to handle pressure from the lawnmower or weed whacker. As soon as the machine hits the tree trunk, it is going to start to break down. Keep away from the tree and make sure there is a self-imposed ring around the trunk. In fact, you can also use a simple guard and set it near the tree trunk to make sure you don’t go anywhere near it. This is often used by professionals as they’re working on a property. What if there is broken wood hanging from the tree? A lot of people wait until it is time to prune their tree and that’s wrong. Arborists state a broken piece of wood can do more damage to the tree than anything else because it impedes future growth. Instead of letting it rot, the right idea is to go out and remove it. The time of year will never matter because the broken wood needs to be removed as soon as possible. Keep an eye out for broken lumber and make sure you are taking action right away. Arborists are often asked about pruning and how it should be done for a tree. This is a good question; one needs to understand the value of timing. Pruning should be done during the dormant season, and that occurs between January up to the second week of March. If you’re looking to prune, you want to do it during this period for optimal results. Any other time of the year is going to impede the tree’s growth, and that’s the last thing you want! Look at setting up a seasonal pruning session to make sure you are on top of things as the landowner. For pruning, you always want to ensure stubs are not left behind because that can damage the tree. Be precise and plan when it comes to a pruning session. What tools are you using while pruning? You want to make sure the right tools for pruning are being used so that you don’t damage the tree. Also, you want to make sure the equipment is sanitized between pruning sessions. This means if you didn’t wash them last time, you want to give them a good wash beforehand. It has a lot to do with how clean the cuts are so you’re not leaving behind part of the damaged wood. Unclean tools are going to offer splintered cuts, and those are horrible for the tree. Take the time to wash them to guarantee good results. For landowners worried about animals damaging their tree, it’s best to go out and get a quality tree guard. The tree guard is designed to act as a simple gate to keep animals away. If not, the animal is going to scurry up the tree and do a lot of damage. Take the time to install this card as soon as you can because it will offer tremendous value. Another benefit of a tree guard is its ability to help keep the nutrients where they belong. A lot of times, a tree without this guard can start to lose its nutrients and not retain water as well as it is supposed to. This is why setting up a tree guard is a great way to optimize everything. One of the best tips a person can keep in mind would be to prepare a schedule. Caring for a tree has to be done in a structured manner. Otherwise, you’re going to forget, or critical dates will be missed whether it has to do with mulching, pruning, or watering. If a schedule is set, you’ll avoid mistakes. These are the most important tips for tree owners looking to make sure everything is in order. Take the time to analyze your processes and make changes as necessary. Don’t be afraid of change and know it is a part of learning how to take care of your tree. For more information visit https://www.evanstontreeservice.com/ and if you have any queries related to tree care, contact us directly on (847) 563-4044.